The CSIRO has regions for projecting the impact of Climate Change. See https://www.climatechangeinaustralia.gov.au/en/climate-projections/futur... This sub-state, Murray River Sub-State (S4), is one of the clear projections in a CSIRO cluster called "Murray Basin region". 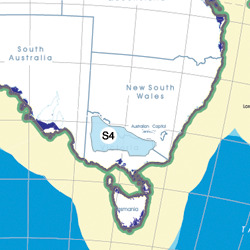 CSIRO's Murray Basin region coincides with BloggerMe's S2,S3,S4,S5. "Murray crayfish never fail to impress. When you pull up the hoop nets from the murky depths and those large white claws start waving about, the uninitiated invariably recoil, sometimes even threatening to upset the boat in their efforts to avoid these spiny armoured angry aliens." Wodonga? "@theage: All hip and happening. Australia's coolest city is ... http://www.theage.com.au/travel/all-hip-and-happening-20121109-292ym.html … "